Definitely would recommend. Got a second one in another color. This cotton Shaggy Chenille bath mat offers your bathroom, kitchen or any space a touch of great styling and amazing comfort. 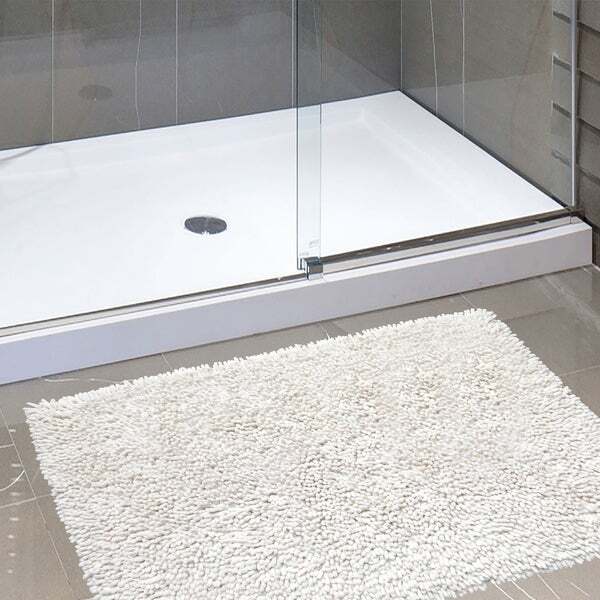 These soft, plush bath rugs come in ivory, linen, white, pastel blue and purple to match your interior decor and taste. The easy machine care will make this a favorite for years to come. Easy care (machine wash and dry) and super absorbent. There is no non-skid backing on this rug. It was a nice feeling and looking rug. However, it didn't last that long. Once it got dirty, it was difficult to clean, and once I tried to clean it, it started to come apart. The color that I ordered was very vibrant though. I wouldn't recommend it for a busy family bathroom, but if you have a guest bathroom or a lightly used bathroom it might hold up better. It's nice but there is no rubber backing on it so it does slide around. Had to buy a non slip pad for underneath it. Perfect - just as pictured. I have also washed and they hold up. Just wish I could find toilet seat covers by this brand! works well. does what is suppose to do. It's not, unfortunately: it's more of an ivory. The picture is accurate against the white shower floor: it's more like stone or ivory. Shag Chenille 100-percent Cotton Kids 20 x 32 Bath Mat - 1'8" x 2'8"